Sydney Shop Girl: TomKat. The Price On Carbon. Forewarned and Forearmed with Mum and Gina Ford. TomKat. The Price On Carbon. Forewarned and Forearmed with Mum and Gina Ford. Somehow, the world did not end with the official demise of TomKat and the official start of Australia's tax price on carbon. This weekend is probably the only time in Australian political history that Hollywood had an active role in easing national wariness towards yet another tax and delegation as the answer to our asylum seeker crisis. Those dedicated to the cause at www.freekatie.net released this revised commemorative T-shirt. Whilst others had just three words for Ms Holmes. Whatever the adults may be feeling toward each other right now, I hope they don't forget the wellbeing and best interests of the person who stands to lose the most if things get very nasty in court - their daughter Suri. Meanwhile, it's been less than 24 hours since the carbon tax came into my life and it's been break even with regard to the household budget. 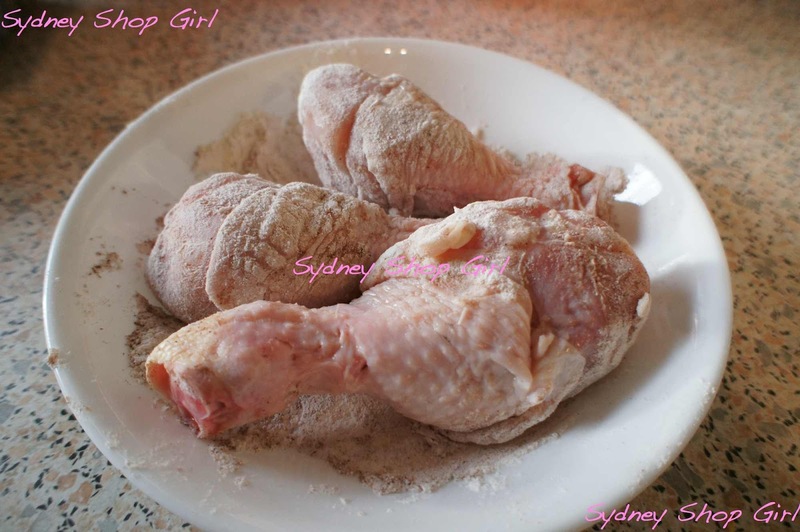 Heavily discounted organic chicken drumsticks dusted in five spice and plain flour before being browned. On one hand, I got these organic chicken drumsticks for half price at Coles on Saturday. 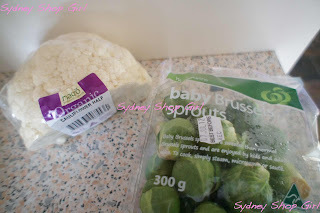 Some of the key players in my 'fun with cauliflower and brussel sprouts' pasta dish for dinner tonight, with thanks to Donna Hay magazine's cauli feature in the current issue. But paid full price for my groceries at Woolworths today. 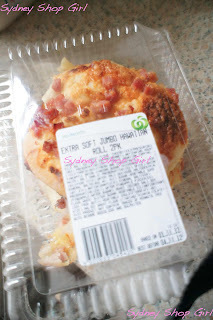 At least Woolies don't scrimp on the Hawaiian toppings for their fresh baked, extra soft rolls. Seeing them on display in the bakery section brought back such fond memories of childhood post swim snacks that I had to buy a packet for lunch today. 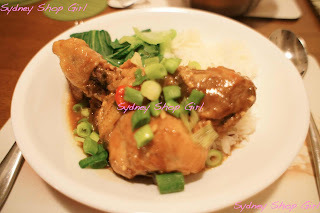 The organic drumsticks were put to good use in a Chinese Braised Chicken recipe I found in this week's Good Living supplement in the SMH. 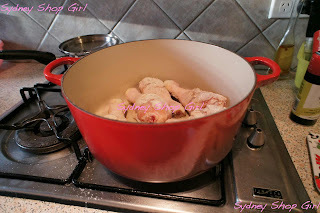 My cherry red Le Creuset casserole pot was pressed into service for both the browning and the braising of the chicken. I think my mother would approve. We've been talking a lot about dealing with pregnancy recently. The thing about mothers is that they impart pearls of wisdom to you weeks before you need it. Which makes for what seems like a very random chat at the time but on reflection at a later date (under the shower whilst your conditioner soaks for a bit) all makes perfect sense. Over the weeks, we've talked about shower safety, taking a break from work early on in the piece and the virtues of bulk cooking one pot meals for dinner. And wouldn't you know it? Everything she's said has come to pass. I braised the chicken in a combination of stock, hoisin sauce, spring onions, red onion, chinese cooking wine, dark soy, ginger, chilli, garlic and a cinnamon stick (for dramatic effect). The end result was 'falling off the bone' tender chicken which had absorbed all the flavours of the sauce over its cooking time. I've made my first steps into the land mine of parenting guides. I had no idea that such a universal skill could be source of great controversy and divided opinion, even amongst the experts. I started with Gina Ford's book, 'The New Contented Little Baby Book' because a friend on twitter was reading it and I'd heard of Ford's approach being mentioned in almost reverential tones. I'm going into my research and reading with a pretty open mind. Unlike writing a paper, there is no guarantee that anything I read now will have much impact on the workings and general wellbeing of SSG Manor and its residents come December. Ford's premise is that the earlier mother and baby establish a routine, the better the outcome for both. Much of the book deals with the practicalities of sleep and feeding. However, I've also found it to be a good source of basic 'preparing your life' for a baby knowledge. 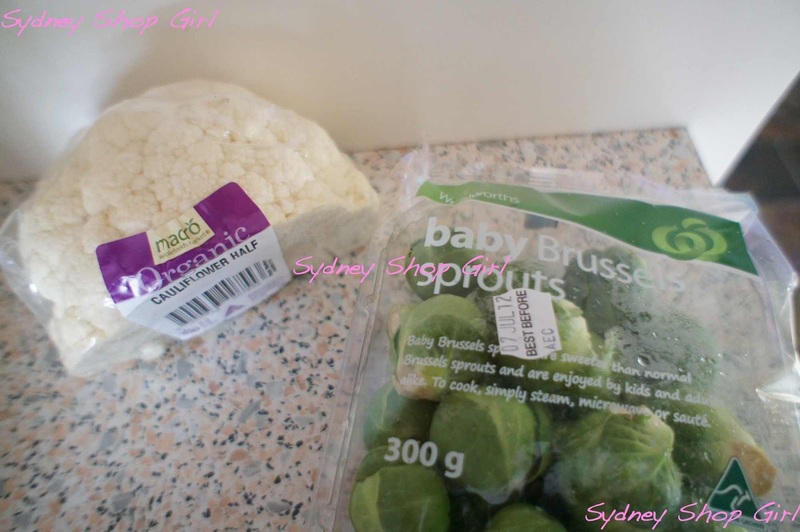 As someone who has had very little first hand experience with babies, the advice about clothing and furniture choices has helped me approach the upcoming shopping expeditions with at least some idea of what to look for and what to leave behind at the shops. I do appreciate that whilst Ford's approach may not work for everyone, she does back up why she advocates certain practices and what she perceives the pitfalls of other schools of thought to be. There are also lots of diagrams to explain things like how to swaddle a baby and how to make up a baby's cot. I knew those years of learning to tie scarves from Hermes and Liberty knotting cards would be put to another good use one day. To be honest, I'm one of those people who goes into major life changes planning for the worst case scenario and then being pleasantly surprised that it all really wasn't as bad as I feared it would be. Which is what I keep telling myself as I read the book because it's all starting to sound a bit overwhelming on paper. But as they say, forewarned is forearmed. What I really need to do though, is give mum a call again and see what she has to say. Best advice I ever received about baby books was from an older GP who had had 3 children of his own. He pointed out that the problem with the baby books was that the baby hadn't read them.... Too true. Talking to your Mum makes perfect sense. Still just thrilled for you that the baby is coming. PS - I got so cross one day early in my forays into parenthood that I threw all the books except for Robin Barker's "Baby Love" across the paddock. I agree with A Farmer's Wife - in the early days Baby Love was the bible. The others were, unfortunately, useless. I know it doesn't help the analytical mind but it's better to go on instinct. It has served us well. I remember crying when reading What To Expect When You're Expecting. It all sounded so hideous!!! In the end I read nothing and consequently knew nothing. I got my family to do the nursery and buy everything I needed, I had an elective c and formula fed. I learnt everything I needed to know in the hospital in the post operative days. I also googled when I wasn't sure. I highly recommend going private if possible. The nurses and midwives are awesome. Also at the SAN Wahroonga, the peds visit every morning so you can ask questions. As I mentioned on Twitte,r Gina Ford didn't work for us, but I was still grateful that I had something to try rather than "rely on instinct". I didn't have any "motherly instinct" as the midwife as the hospital suggested, my mothering skills were gained from days and days of trial and error. Will be interesting to see if Gina Ford works for you. Your dinner looks yummy! :) You're so right about mum's advice too - I don't know what I'd do without my mum, she always seems to know what to say. Parenting books are interesting, some parents swear by them (especially tizzie hall) and I admit to reading he baby whisperer while I was pregnant. What a waste of time that turned out to be! The only book I found useful post baby was the happy contented baby written by a paedetrician and had useful gentle settling techniques. A couple of mothers in my mothers group use save our sleep routines and it works for them but I can't help but think that babies aren't robots! Like he first commenter said, the babies haven't read these book so dont be disappointed if they don't follow the routines of the book. I know you will have an open mind about what you do once bub comes. Just follow your motherly instincts. You and your baby will find a natural rhythm and routine. Thanks for the Baby Whisperer rec. I agree, in principle, establishing routine is great but it may not always happen at the same time for everyone. I am sure I will be coming up with a few clangers about child rearing in the coming months. There's something that separates the parents to be and the parents and I think that would be unpredictable babies. I'm tracking my mum down this week for more of her wise words! That's a good point. The books cover the whole spectrum of situations and there are so many variables relating to both parents and children. It'll all come together on the day, somehow! That's where I'm coming from too, with regards to reading all these books. To have some frame of reference and lots of information to cobble a bit of an approach together. Thank you for your advice and I'm sorry it was a bit rough at the beginning. Hope it has all settled down for you now. I've been seeing my obs and everything's booked so fingers crossed! It's unchartered territory having to rely on a combination of instinct and research but I'm willing to give it a go! I think we all need paddock access for those days when it gets a bit much. Those are wise words from the GP. I agree G was too restrictive and I never ever would wake a sleeping baby. My baby slept 8 hours during the day for ages and then all night- my sister used Gina and used to tell me to wake him so after a day sleep early so he'd sleep all night- AS IF!!!!! I'd say run like crazy from the parenting books, read books that talk about the baby and what scientists, good ones, think the baby might be going through. But, of course, that was just my particular approach. I couldn't bear to hear mine cry. I've also started a couple of books and felt pleased that I could learn a few things that might help, but also that there's a variety of ideas out there which just proves that if there was one single way to do it, we'd surely know by now! But I'll add to the reams of advice by recommending The Sensible Sleep Solution. It's written by psychologists so quite evidence based, but it positions itself as a 'middle way' and made for parents who neither want to control cry, nor have no routine at all. I haven't finished it but it is very non-judgmental (ie: Pro: dummies can be very effective and can help some babies self-soothe. Con: you might have to get up every ten minutes to pop it back in your baby's mouth), and so far it appeals greatly to my desire for a no-fuss, sensible approach to caring for my baby. It's a bit of practicality mixed with a bit of instinct which I really like. I think I'm really just going to focus on having a routine for my own sanity, but knowing that I'll also just do what I think is best for The Bunny at the time. Thanks for your book suggestions. I have an approach like yours, good to have a bit of background information but also willing to go with my instincts if need be. Hope all is well with you and The Bunny! That'll be me as well with regard to the crying. Thank you, as always, for your insight. Thanks for all your thoughts. Tizzy is on my reading list. I am not a Tizzie fan (although obv parenting is all horses for courses) as I don't like young babies being put on schedules. However, it is 100% true that sleep begets sleep and self-settling is definitely the aim. I haven't read Gina but don't mind a bit of Tracey Hogg (The Baby Whisperer). We didn't really subscribe to any though (and didn't buy any of the books either). Our priorities were: Feed-Play-Sleep routine (I think this is crucial+++++++); learning to fall asleep in bassinet; resettling to try and achieve longer naps. I didn't push the STTN thing at all and at 4 months S has just started sleeping 10 hour stretches o/n.